It is a challenging time for all nonprofit organizations, but teen pregnancy prevention and sexual health organizations are especially hit hard by recent budget cuts and the risk of elimination of many essential sources of funding. While the time is now to contact senators, representatives, and other political figures to get their support for teen pregnancy prevention and adolescent sexual health, it is also time to consider how you can make your organization more sustainable during these tough economic times. planning, program development, evaluation, and management consultant services to foundations, nonprofit organizations, corporate community involvement programs, and government agencies. This paper points out the importance of leadership, fundraising, and program capacity in ensuring organizational sustainability. For successful leadership, coaching and peer exchange are among the most effective leadership development tools. Important aspects of fundraising for nonprofits include networking, strategic alliance formation, and board development. In order to ensure program capacity, managers should focus on staffing programs and be willing to hire and fire as necessary to ensure the highest quality and quantity of services. The TCC Group points out some critical factors that separate high-achieving nonprofits from those that are not sustainable. Organizations that have the capacity to raise funds from grantmakers such as private foundations, corporations, and government agencies are more sustainable, as are nonprofits that achieve credibility and community support, which strengthen funding relationships. Another important aspect of a sustainable organization is a board of directors that is actively engaged in fundraising for the organization and persuading others in the community to become involved in the organization. Financial management and fundraising are key aspects of a sustainable organization, but you shouldn’t forget the importance of the actual programs and services your agency conducts. Organizations that collect and use high-quality data from program evaluation and gather stakeholder input for planning and strategy implementation efforts are significantly more sustainable than those that do not. The TCC has found that sustainable and effective organizations do not simply collect data on their programs, organizations, and the community/environment, but their leaders also actively bring these findings to the planning table. Effective program staff and program leaders learn from the evaluation data they have collected and harness this to better their organization and programs. The TCC Group creates a useful “Sustainability Formula” at the end of the article which equates that Leadership + Adaptability + Program Capacity = Sustainability. This formula could serve as a great guide for a struggling organization and the article goes into much greater detail about each part of this equation. Effective leadership is extremely essential for a sustainable organization. 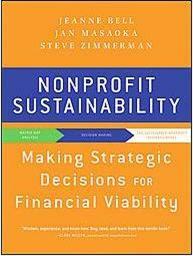 The leadership within the nonprofit must be able to present a clear view of the mission and vision of the organization, must be able to motivate others to get behind the mission and vision, must be able to take decisive action when faced with challenges, and decisions and accountability must be anchored in cost-effectiveness. Credibility, relationship-building, and transparency are key elements to donor cultivation as well as maintaining long-term donors and contributors. Relationship-building through site visits, networking, personal appearances in the community, and etc. leads to donors and foundations that are willing to stand by your organization through rough economic times. Transparency maintains donor and Foundation contributions by proving that your organization has the financial stability to continue servings its constituents and withstand rough economic times – confirming that their donations are going towards necessary programs and services and not overhead costs. Grant funding is a key element of organizational sustainability. To research potential grants, sign up for a program like Foundation Directory Online or GrantStation, State and Federal grant alerts, and Google Alerts on recent funding in your area. /And of course, network in your community to find out where similar organizations are receiving their funding. Strong communication between the program staff and development staff (if there is a development department) is essential. Grant proposals and fundraisers can only succeed if the staff members grasp every aspect of the programs that they are raising funds for. A lot of nonprofits lack open communication skills which lead to poorly executed proposals, ill-informed donor cultivation, and program staff that are unaware of funding restrictions and how funds are raised within the organization. Evaluation of programs and services must be harnessed to better the organization and serve as an opportunity for the organization to learn and grow. I am definitely not an expert on organizational sustainability for nonprofit organizations, but I hope this article can serve as a jumping-off point for those organizations that are struggling in these challenging times. Feel free to e-mail us at tnca@teennowcalifornia.org with your comments and suggestions, and your own innovative strategies for raising funds and sustaining your organization.